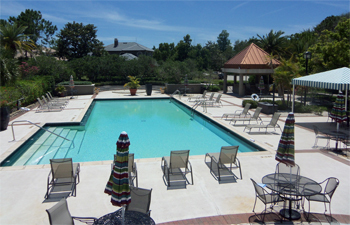 The Bayou Club's pool is a great place to hang out and relax or to socialize with your friends. Full poolside service is available during The Grill hours with a full lunch and dinner menu and beverage service. The Club hosts numerous Member events throughout the year including the 4th of July party, luaus and more. Bayou Club Members also enjoy full pool privileges at Bardmoor, our adjacent sister club, featuring a 25-meter pool for swimming laps or family fun. The children's wading pool is a safe place for our youngest members under the watchful eyes of their adult guardians. The swimming pools are open daily year-round.